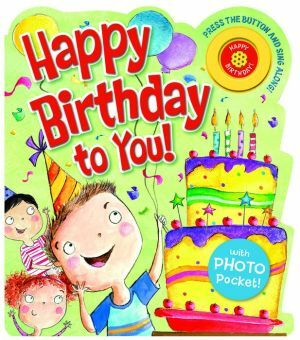 A fun-filled musical book that celebrates the joy of a child's birthday! This musical board book includes all the ingredients that make a birthday special for a child: balloons and presents, cake and candles, and, of course, the birthday song! Follow along throughout a day of celebration, concluding with a good-night prayer, then push the button to hear the melody of Happy Birthday. A photo pocket on the last page allows for personalization. This book won the Selah Award for Best Children's Book of 2017.